We rarely venture over to Bondi but an invitation to Bondi Hardware’s first birthday lured us in. Half of my colleagues are Bondi locals and a few have mentioned Bondi Hardware on a number of occasions. Share plates and a funky vibe, sounds like fun to me! Although my family now lives North West of Sydney my Mum likes to remind me that she grew up in Bondi and still knows her way around. It was quite funny to hear she knew Bondi Hardware… as the hardware store it was for 30 years. These days Bondi Hardware is far from the cluttered hardware store it once was. 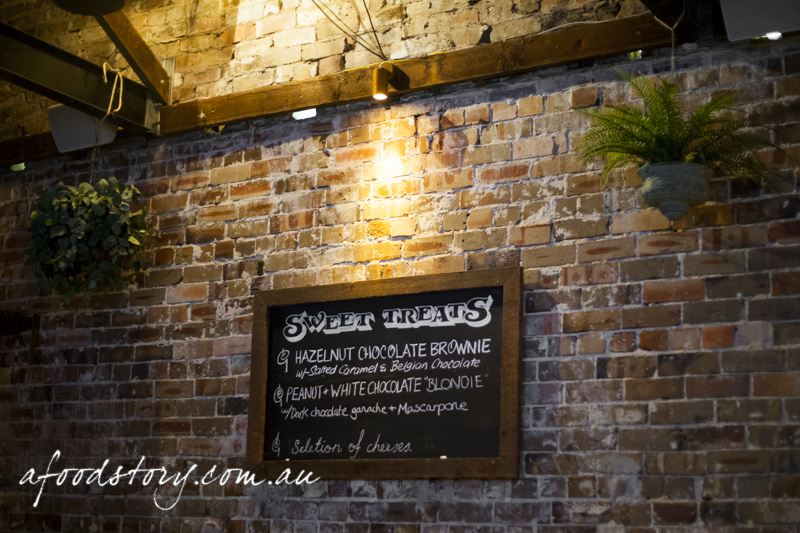 With exposed brickwork and beams, high gabled ceilings and greenery the site has been transformed into a fashionable bar where high tables and stools flank the walls and a large bar is situated halfway down the room. 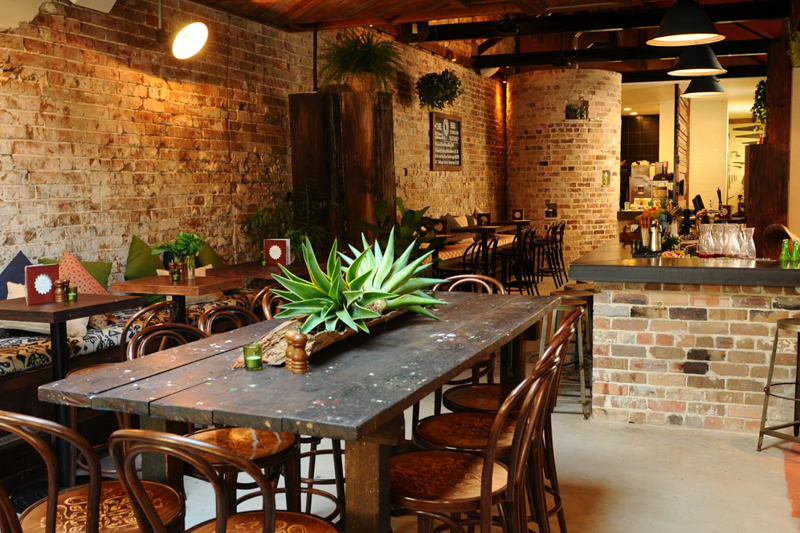 Owners Hamish Watts and Ben Carroll have turned the place into a bustling bar and restaurant. And with head chef Logan Carroll’s share-style menu the place has been rocking. Having recently turned one, Bondi Hardware was ready to celebrate. A DJ was brought in and the crew were dressed in flannel shirts, denim shorts and hardware hats. Bring on the celebrations. 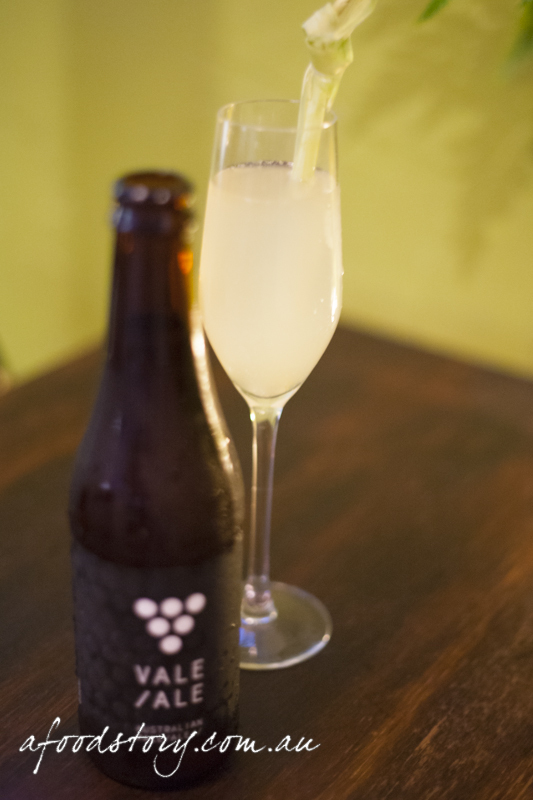 McLaren Vale Vale Ale and Lemongrass Bellini. Dylan went straight for a beer, an easy going Pale Ale from the McLaren Vale. In my mind it wouldn’t be a party without cocktails. So, I decided to kick things off with a Lemongrass Bellini. Quite a nice, unusual aspect to it, distinguishing itself from your run of the mill cocktails. I liked the sweetness of the drink though Dylan found it a little too sweet – potentially due to the use of lemongrass syrup? – and thought the stick of lemongrass would have done the job. Continuing the party theme I couldn’t pass up one or two (or three or four) Raspberry Mules. This is where it’s at. Vodka, fresh raspberries, ginger beer and a squeeze of lime. Oh hell yes, this is an absolutely addictive combination. The key is to avoid any raspberry seeds getting stuck in your teeth. Sorry Moscow Mule, the Raspberry Mule has just replaced you in my book. Classic tomato, basil and bocconcini pizza. Pizza. Possibly my favourite food of all time – if I had to pick a favourite, I’m not very good with favourites. I like Thai and Japanese too much to leave them out. But oh my gosh pizza has a very special place in my heart. 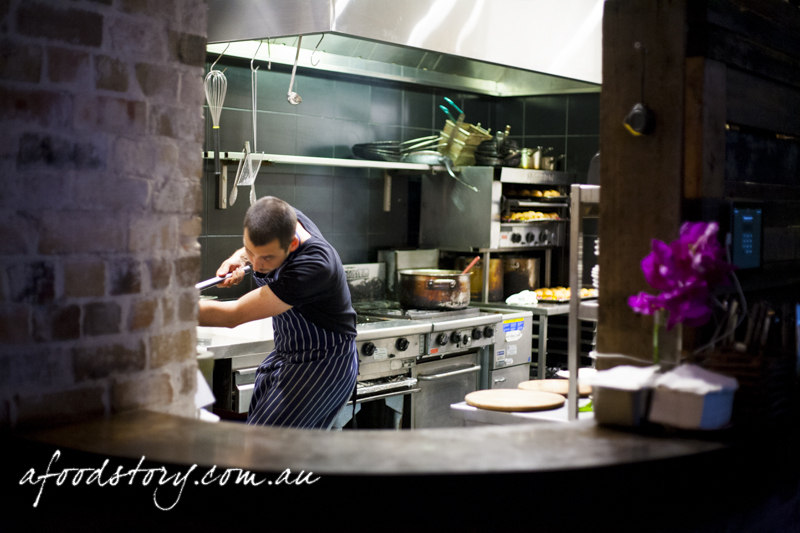 Dylan and I were perfectly positioned in front of the kitchen to watch the chefs work away… and boy did my eyes light up when they started putting pizzas into the wood-fired oven. 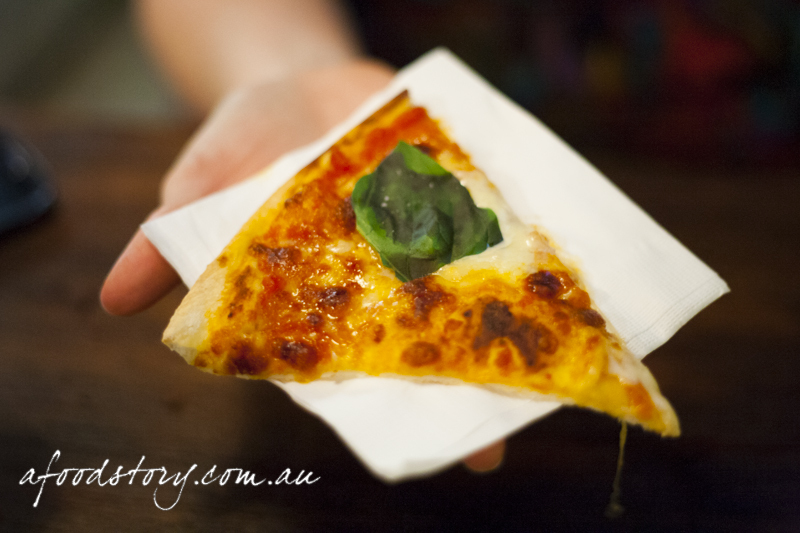 And then they came out of the oven… margherita pizzas came thick and fast which suited me just fine. A thin, crispy, wood-fired base with a small amount of topping, just like it should be. Tomato, bocconcini and fresh basil, a classic combination that when done right is extremely difficult to beat. With the pizza hitting the spot I was expecting something similar from the Greek salad. Piled into Chinese take-out boxes the salad was unfortunately the least impressive of the night. It was just an ordinary Greek salad but with one problem – unpitted olives. Dylan almost lost a tooth! San choy bau is not necessarily the easiest thing to eat without a plate to catch anything that may drop. Yet somehow uncoordinated Lex managed to wrap the cos lettuce leaf up securely and devour the canape in two bites. I was quite proud of my efforts not to lose minced meat all over the floor. 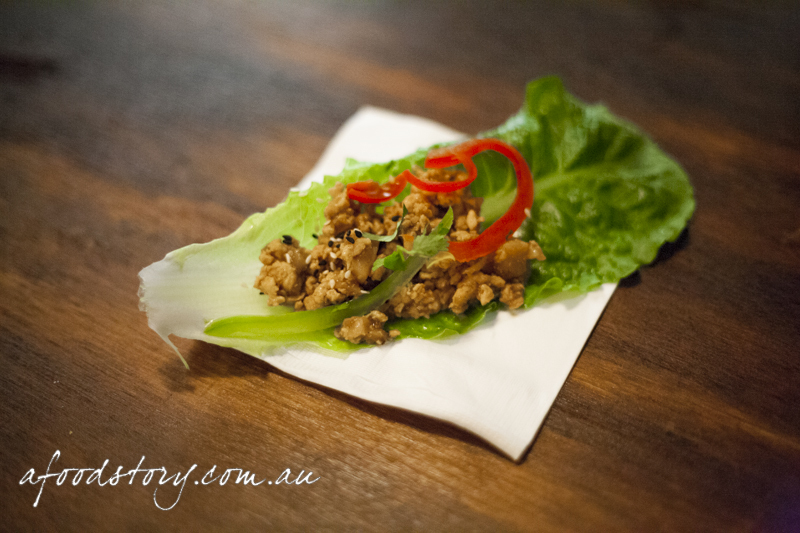 Fresh flavours and juicy filling, the san choy bau was another winner. 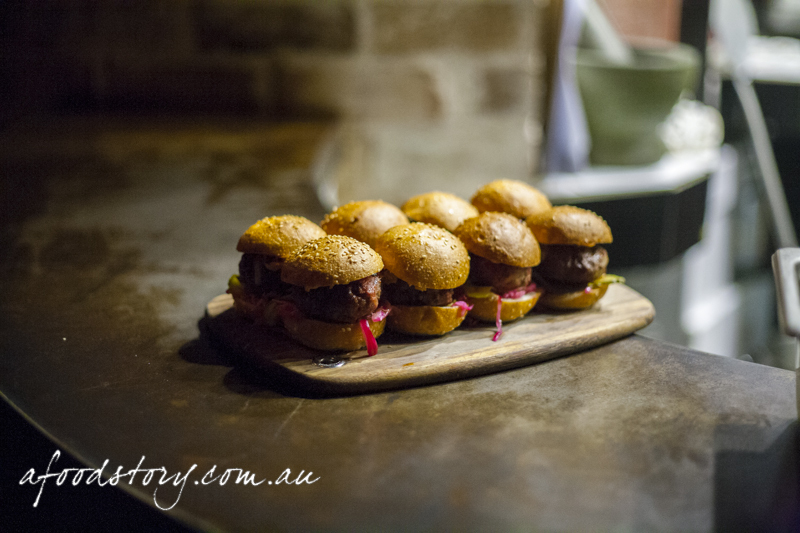 Hardware slider – mini gourmet cheeseburger with pickled red onion, gherkins and tomato relish. I skipped the slider fearing condiment hell. Dylan on the other hand was keen for a slider and struggled to track them down all night. Although everything else came our way it seemed the sliders were destined to bypass us. Eventually he got his hands on one. It started off much like a usual slider but with a few highlights in the pickle and relish – it was a wise decision for me to skip this one. With juicy meat and a number of condiments Dylan found it to be an all round solid slider. With tunes playing, food and drinks flowing the night was going well. We ran into Corinne and Kevin from Gourmantic and were having a nice chat. That is until the music was turned up so loud I couldn’t even hear myself think. The party had definitely started but for those of us with a mission trek home it was time to hit the road. 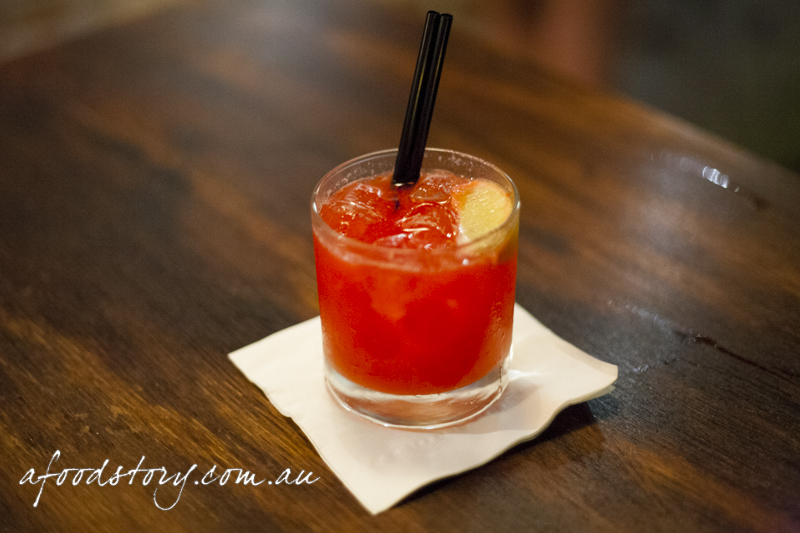 I was really impressed with the food and drinks on offer and loved the vibe of the place. I’m keen to go back on a normal night to suss out the rest of the menu. The hardware store is no more but in its place is a much better offering. Wicked food and drinks. 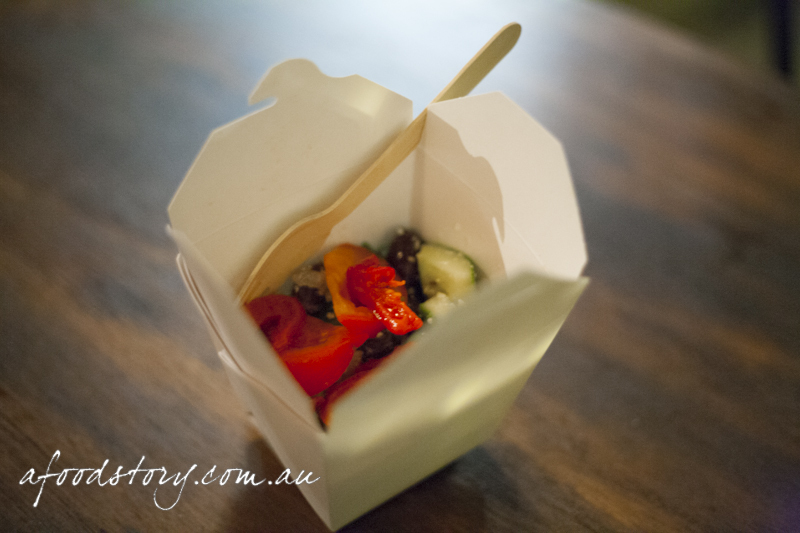 A Food Story attended Bondi Hardware’s first birthday party courtesy of Bondi Hardware and Pendulum Communications.